Evelyn, a 20-year-old teacher from Claremont, NH, failed to make the Top 10 contestants based on home viewer votes cast following Sunday night's performances, but she hoped to snag a spot by singing for survival on Monday night's results show. However, Evelyn's rendition of "Dust In the Wind" by Kansas wasn't enough to convince judges Katy Perry, Luke Bryan and Lionel Richie she should advance, although her vocals were praised. "It has been an incredible journey on @AmericanIdol. I am sad that it is ending for me, but I'm so proud of all of my fellow contestants who made the top 10," Evelyn tweeted after her elimination. "They deserve all the success in the world. Thank you for all the love, and don't worry! I'll never quit on my dreams!" Evelyn then posted a lengthy message to her fans Tuesday on Instagram. "I would love to answer each and every one of you but there are far too many -- so I will respond here to a few things that was mentioned over and over again," Evelyn wrote. "1. I feel the judges made the right choice last night. Idol was never for me -- I was blessed to be there for as long as I was." Evelyn then admitted she "faltered under the stress, pressure and emotions of it all." As a result, Evelyn insisted on Instagram her vocals and confidence on Monday night "suffered where as others used it to propel them to an amazing performance!" "I admire all the contestants and believe they all earned their rightful spots and I am truly happy for them. 2. I am not giving up on music. From day one, I knew Idol was just part of my musical journey -- not the end," she continued. Evelyn then revealed she has "several musical projects" in the works that were put on the shelf while she was competing on American Idol. "I am in the middle of recording an album -- now I can finish it. I have many exciting opportunities ahead that is going to keep me very busy," Evelyn explained. Prior to her stint on Idol, Evelyn starred on Season 5 of 90 Day Fiance with her now-husband, David Vazquez Zermeno, who was shown supporting her throughout her journey on the ABC reality singing competition, which began in December 2018. "3. Many of you are encouraging me to look into another tv show -- being on tv is not my favorite thing (except maybe Family Feud -- that might be fun!!) but thank you for believing in me and wanting to see me succeed," Evelyn wrote in her Instagram post. "4.Yes, I am in agreement -- This was an amazing opportunity that put me in a position to be seen and heard by many important people in the music business. I am thankful and fully believe that God opens doors that no one can close, and closes doors no one can open." Evelyn concluded her post by saying she has a lot to be thankful for and look forward to. "5. Yes, I do currently have original music available! You can find it on your favorite streaming or downloading site! And more is on the way! Again, I want to thank you all for your love and support. I feel like this ending is just another beginning. #thebestisyettocome." 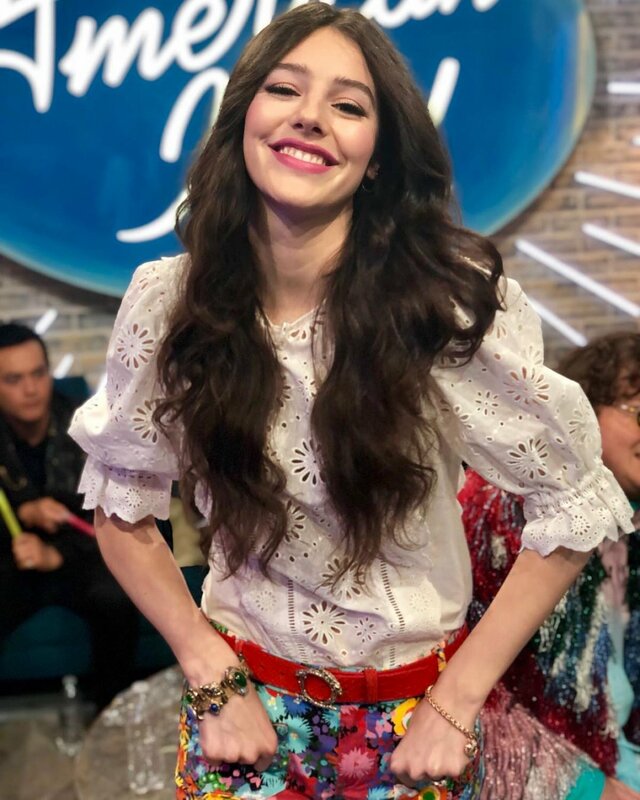 On Sunday night's Top 14 performance show, Evelyn received extremely positive reviews from the judges for her performance of "The Middle" by Jimmy Eats World. "Just when we think we have someone pegged, we like to see a whole other element," Luke noted on the show. "Great job."